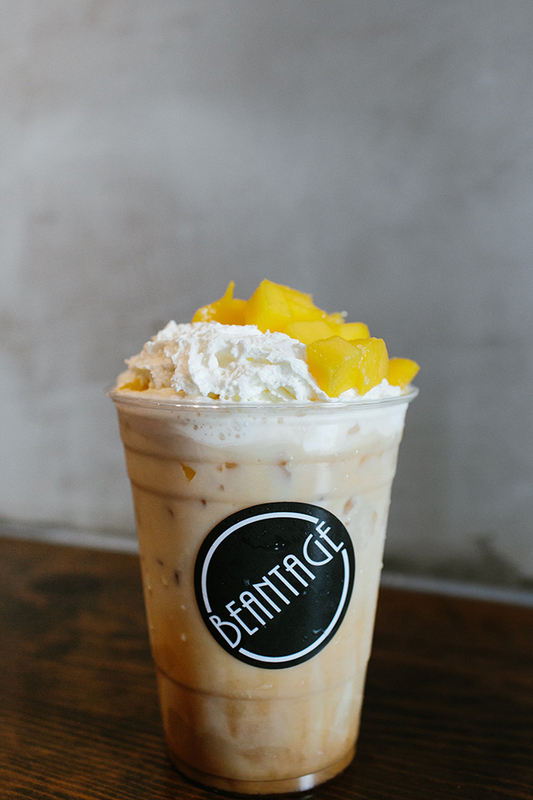 Situated a few doors down from the ever burgeoning Grand Central Market, Cafe Beantage occupies a narrow frontage that, for many years, belonged to a cigarette shop. “I used to walk by and think, that space could do so much more than sell cigarettes and bottled water,” says proprietor, Charles Kwon. Eventually, Kwon made an offer to buy the space and, as fortune would have it, the owners were ready to sell. Renovating was no small task, as the building had to be gutted down to the sewage pipes and Kwon wondered if he could compete in a city flooded with good coffee. Discerning the subtle differences in tastes between coffee offerings in the area, Kwon realized he had to cultivate a clientele by offering something uniquely his own. He explains, “The taste of the coffee is really important, but more than that, is the service - how we treat the customer and the environment we provide.” With that in mind, Kwon designed the interior of Cafe Beantage to provide a respite from the incessant traffic and bustle of Broadway. Muted greys, exposed brick and concrete, torched woods and burnished metals create a calming space that is decidedly Zen. Seating is situated away from the street, in the back of the cafe, where a large communal table holds court. Free WI-FI and outlets abound, with the thoughtful addition of USB ports so guests can charge their phones. “The concept was one of well-being,” says Kwon, as he begins to wax poetic on his philosophy of tea. Teas at Cafe Beantage are exclusively organic loose-leaf, brewed in individual teapots, and poured overhand. Kwon also offers a selection of house-bottled cold brew coffees, which are clearly labeled with their bean of origin. “Many people enjoy a coffee but don’t necessarily know what kind of bean they’re drinking,” Kwon explains. In this way, Kwon hopes to educate his clientele and share what he’s learned as a student of the bean. Driven by a curiosity about international developments in coffee, Kwon researches how coffee cultivation varies from country to country. “Europe, South America, Africa, Asia, they all do it differently. I study what they’re doing and try to develop it.” It is this research that led to the creation of his now famous and sought after Iced Strawberry Latte. Made from a proprietary recipe involving espresso, fresh strawberries, milk and whipped cream, the subtly sweet concoction tastes something like an adult version of strawberry milk with a chocolaty note of espresso. Mango and Banana versions are also available.